In the past, if I wanted to have red beans & rice on the dinner table in a hurry, that meant using canned beans. And, unfortunately, the texture just wasn’t quite the same as starting from scratch using dried beans… My ideal red beans & rice have a bit of a bite to them – You know that perfect spot, when they’re cooked through, but not mushy? But now, my Instant Pot has changed all that! I can have perfectly cooked red beans & rice on the table in under an hour! Even though it’s called red beans & rice, let’s not leave out the most important ingredient – The sausage. Seek out a good quality smoked sausage or Andouille sausage – You’ll find it right in your regular grocery store. That sausage is the first thing that we get going with this recipe. 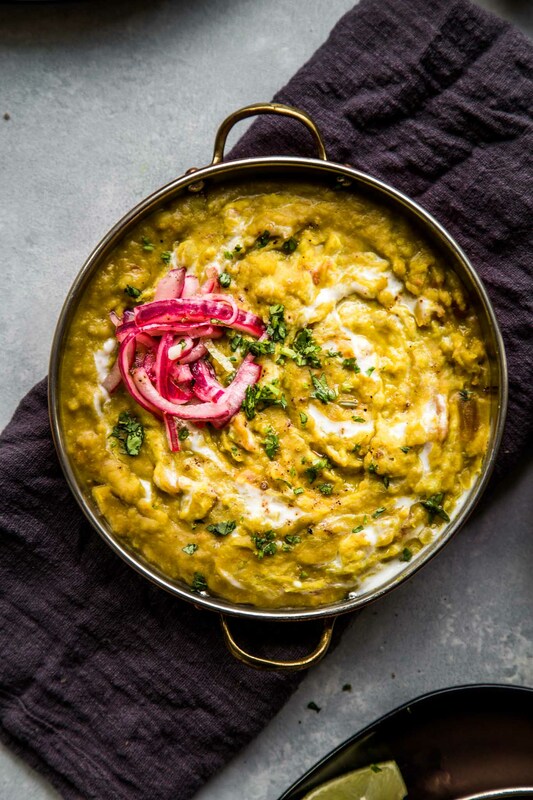 Slice it up and sautee it in your Instant Pot, rendering out all the fat and yummy flavors. Once it’s nice and brown, we’ll scoop it out, but leave the yummy drippings behind, using that to sautee up our aromatics of onion, celery and garlic. A good sprinkling of creole seasoning adds great flavor and a hint of heat – Go as heavy or as light handed with the seasoning as you’d like. Personally, I like a lot. I sprinkle in close to a tablespoon. We’ll add some other seasonings in to the mix too – thyme, oregano, tabasco, allspice, cayenne. We want to be sure to add lots of flavors in there because they’ll help flavor those beans right from the get go in an inside out kind of way. Throw those beans into the pot, along with the reserved sausage, and top your Instant Pot off with just enough water to cover everything up. You should make it to this point in about 15 minutes or so. After that, it’s all hands free. 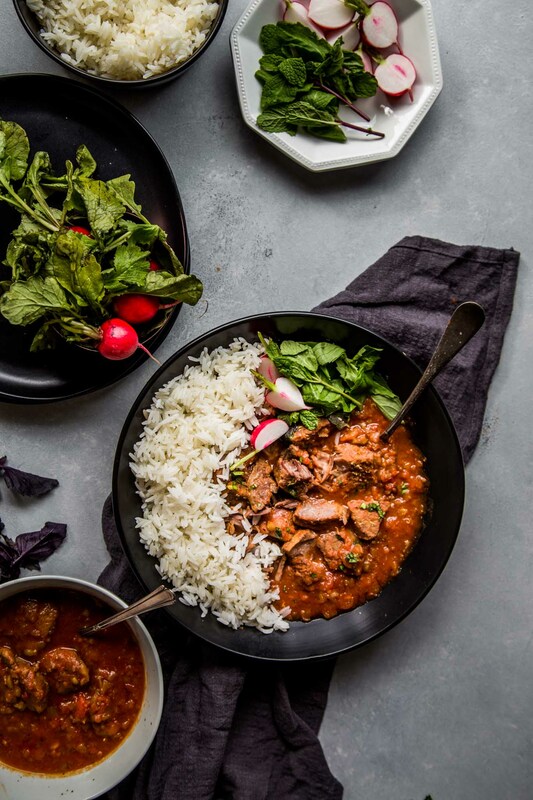 Set your Instant Pot to cook on high pressure for 35 minutes and you’re free to go about your other work – For example, opening up a bottle of wine, taking off your work heels, and catching the first half of Real Housewives. Once the 35 minutes is up, let the pressure of the Instant Pot release naturally. This should take about 20-25 minutes. This is also a great time to get your rice started and to chop up the parsley and scallions that we’ll be adding in later. Once the pressure releases, check your beans for doneness. They should smash easily against the side of the pot. If they’re not yet cooked fully, return the pot to high pressure for 3 minutes and repeat the natural release process. Finishing off our pot of rice and beans (and sausage) with a good big palmful of parsley and scallions brightens everything up at the end. I’m pretty sure you’re going to want a bit more salt in there at the end too – I’m a “salt person” and I add in at least a heaping teaspoon or more… And, be sure to serve your bowls of red beans and rice with some extra Tabasco on the side, maybe even with some additional creole seasoning too. This recipe for Instant Pot Red Beans & Rice has been on regular rotation at our house during the past month. The leftovers are fantastic too. Let me share a lazy tip with you – I just leave the leftovers in the Instant Pot liner, cover it and store it in the fridge. To reheat the red beans and rice the next day, I put the liner back into the Instant Pot, seal the pot and cook on high pressure for 5 minutes. Quick release the pressure and presto – You’re ready to eat (again)! Sometimes I add in a bit more water before the reheating process too – If things are looking a little dry. Have you jumped on the Instant Pot bandwagon yet? I honestly can say that I use mine at least a few times a week. And, if I wasn’t such a minimalist, neat freak, it would even have a dedicated spot on my countertop. 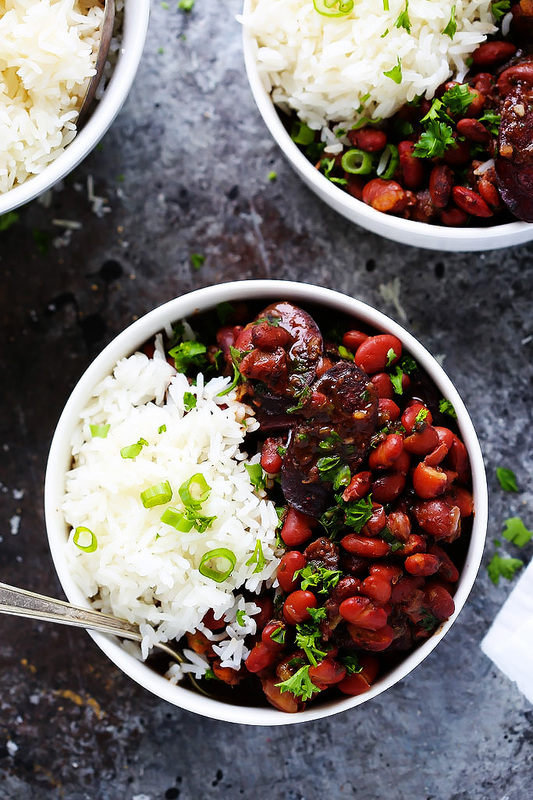 Instant Pot Red Beans & Rice is a traditional New Orleans recipe made with smoked sausage, red beans and cajun seasoning. 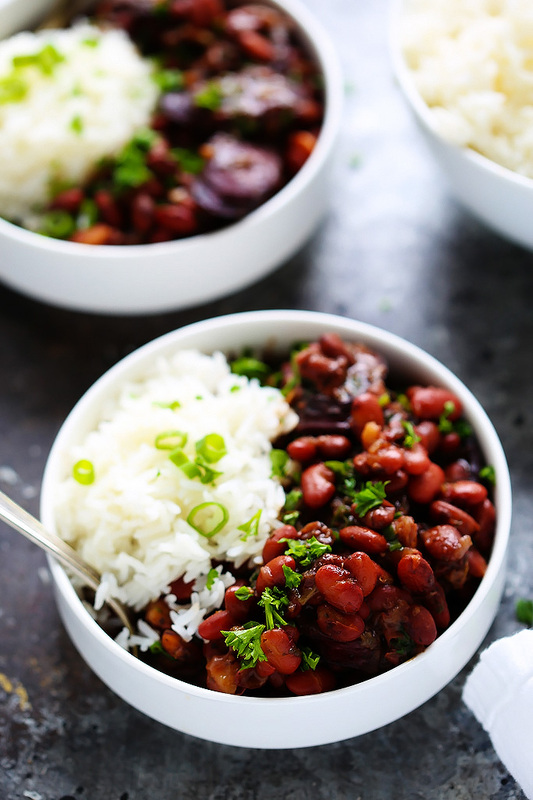 Plus, with the help of your pressure cooker there's no need to soak the beans, meaning that this delicious dinner can be on your table in under an hour! Place the oil in the insert and turn Instant Pot to the sautee setting. When oil is shimmering, add sausage and brown. When fully cooked, remove with a slotted spoon to a paper towel lined plate. Leave the grease in the Instant Pot. Add onions to Instant Pot and season with creole seasoning. Sautee until tender, about 5 minutes. Add the garlic and celery and cook until translucent. 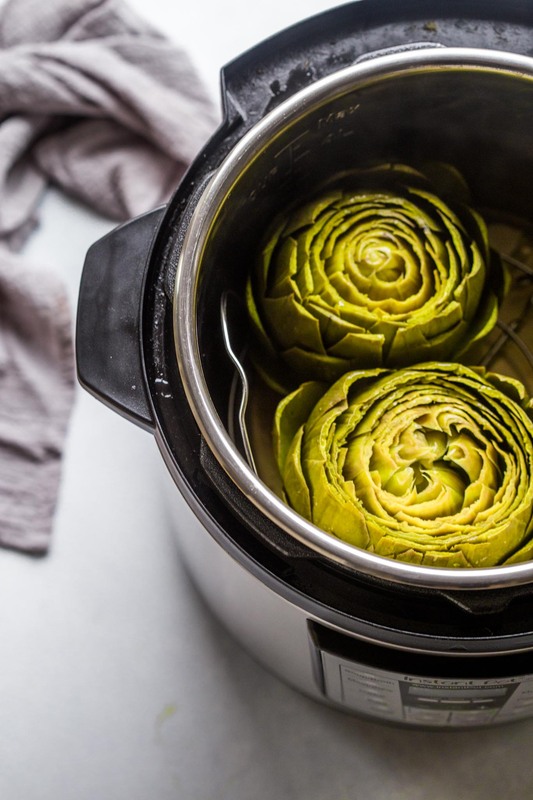 Allow the Instant Pot to release naturally. This should take 20-25 minutes. Uncover and test beans for doneness; they should smash easily when pressed against the side of the pot. If the beans are not quite done, return to high pressure for 3 minutes and repeat natural release process. Stir in salt, scallions and half of the parsley, reserving the rest for garnish. Taste and season with additional salt, Tabasco or creole seasoning. If you loved this recipe for Instant Pot Red Beans & Rice I would appreciate it so much if you would give this recipe a star review! Also, be sure to snap a picture of your “plating and pairing” and share it with me on Instagram using the hashtag #platingsandpairings and tagging me @platingsandpairings. Try a Gewurztraminer. Its hint of sweetness pairs nicely with the heat and bountiful spices in this dish. Looking for a red wine? 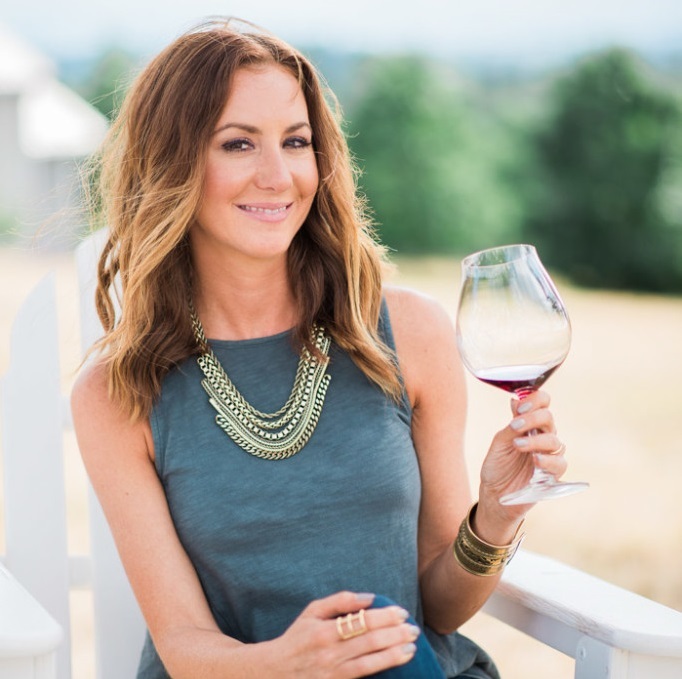 Try a Zinfandel. It’s got a bit of smokiness to it that pairs well with the sausage and a hint of acidity that ensures it won’t overpower the red beans & rice. I keep seeing these insta pots and still haven’t bought one! I’m inspired to do so now because this recipe is right up my alley and I love the idea that you can get all that flavor in in a shorter time. Amazing! 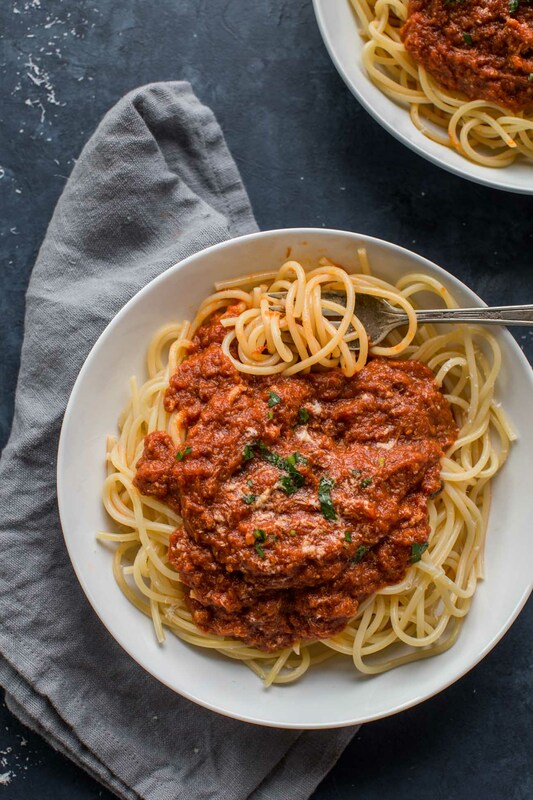 The Instant Pot is amazing – I promise that you’re going to see more and more Instant Pot recipes of my site too… I’ll be testing one out tonight! Does this ever look like a comfort food dinner for the win! I can see why this recipe has been on your dinner rotation regularly! I can’t wait to try this for my family! Great tip for leftovers! I haven’t ever tried reheating in my Instant Pot, but I will now! Thanks Laurie – YES! The Instant Pot has been a lifesaver for reheating, especially since we don’t have a microwave! This was excellent…I used a lower fat Kielbasa , and it was diet friendly and great! That sounds like a great substitution Kathy – So glad to hear that you enjoyed the recipe! I add a flour to my vegetable saute to create a roux and once the beans are finished I blend a cup or so in my Blendtec blender (Vitamix competitor) and return the blended mix to the pot and stir to combine. These little additions create a gravy that thickens the recipe that makes for a more traditional, thicker outcome. Flour, not “a flour” … that’s what I get for not proofreading. Thanks, John. I’m going to try it with your suggestion. Happy New Year! Delicious! And it’s hard to please us Louisiana natives with new recipes for our traditional food. It will be on my regular rotation as well. I “veganized” it by omitting the sausage and sautéing in veggie broth instead of oil. I also cooked my beans in veggie broth instead of water. And cooked them longer since we like our beans softer. Your seasoning is really, really good. The allspice is a brilliant addition. My carnivorous husband said he could eat this veganized version every week! i used way too much creole seasoning….tooo HOT! How much should be used? Is there a way i can calm the heat down? Was this supposed to be really soupy? It tasted great, but I’d have preferred it to be thicker. Hi Christina – Mine turned out quite thick… Hmmm. I’m not sure? Maybe others can comment on how it turned out for them? Erin, thanks for the recipe! I made it tonight, and while the beans I had could have gone another five minutes to be absolutely perfect, they were delicious! I substituted a Chipotle chicken sausage, because it’s friendlier on the Weight Watchers point system. Using your estimate of four cups of water, there was just enough juice for the rice to soak it up. Also, with the amount of thyme in the recipe, it had a more “herby” taste than I’m used to, but the more I tasted it, the more I really liked that change. The recipe is definitely a keeper in our house. So glad that you enjoyed the Red Beans and Rice Jeff! Love your substitution to make things a bit healthier too! Hi Jolie – You should be able to double this recipe in the 6-quart Instant Pot. Just be sure that it doesn’t go past the MAX fill line. You do not need to soak the beans Jamie – That’s the great thing about the Instant Pot! Wonderful recipe. It definitely took me more than an hour. After all the chopping (and I am pretty fast), I still pressure cooked for 40 minutes, checked and had to cook for 3 more minutes. The natural release took about 30. I did cut back on the Thyme bc I am not crazy about an earthy flavor. I didn’t even have to add more salt..definitely check beforehand. It probably depends on the type of creole seasoning. Very, very good! I’m so glad to hear that you liked this recipe Cristy. Did these for 40 minutes and natural release. Turned out wonderful with all the flavor and not all the salt that packaged mixes have in about the same amount of time. Has a much better texture too. LOVE LOVE LOVE this recipe. Thanks for posting it. I thought everything was spot on. I used chicken andouilli sausage from Costco. Trying to keep in Weight Watchers!! Love those healthy swaps that you make Jeni – I’m going to have to give that a try this week. Trying to eat extra healthy before our wedding in July! This was delicious, but next time, I am going to cut down on the salt. I added 1 tsp of salt before cooking the beans. Next time, I will season to taste AFTER cooking the beans, like your recipe says to do. I’m glad I only added 1 tsp of salt, and not 2 like the recipes states. We did a few things different: I used frozen seasoning mix (onion, celery, bell pepper, parsley) and was afraid it’d come out mushy, but not at all! And went with turkey smoked sausage since it’s the only AHA certified-humane sausage we can find nearby. Also loved the seasoning ingredients, but definitely needed to pressure cook longer than you said to. It might be my fault since I used pinto beans (only way my mom and Grandma ever made red beans & rice), but that’s just something to note if anyone else uses them. Other than that, though, this was definitely a hit for my husband and son! This has been cooking in my instant pot and after 35 min the beans are no where near done. Not sure where I messed up but this is not quick. Ugh. Hi Allison – They should definitely be done with 35 minutes… Did the pressure build in your Instant Pot? Perhaps you need to check the seal? Older beans will take longer to soften, so that might be the issue with some who say it takes much longer than recipe states. Even if just purchased, they may be old. Thanks for this tip Teresa! Is all the water supposed to be gone when this recipe is done? The beans were underdone when I followed your directions and there was still water in the pot. This was a tasty recipe but the beans were still crunchy after adding on two more rounds of pressure cooking. Also it was so super spicy!!! I will definitely cut down on the creole seasoning. It may be helpful to your readers to specify the amount of creole to add to the onions. Thanks Noelle – I just updated the instructions to hopefully clarify that more. I also noted in the post, that if your beans need more time, to give them another 3 minutes of high pressure. When u say natural release do u mean just letting it stay on warm. Or actually turning the knob to venting? Hi Sobi – Natural pressure release means that you will hit CANCEL and let the pot rest for a bit to allow the pressure to release BEFORE turning the knob. Hope that helps!